Floral Park, New York, U.S.
John Towner Williams (born February 8, 1932) is an American composer, conductor, and pianist. With a career spanning over six decades he has composed some of the most popular and recognizable film scores in cinematic history, to many of the highest-grossing films of all-time, including Jaws, the Star Wars series, Superman, E.T. the Extra-Terrestrial, the Indiana Jones series, Jurassic Park, Schindler's List, and the first three Harry Potter films. Williams has been associated with director Steven Spielberg since 1974, composing music for the majority of his feature films. Other notable works by Williams include theme music for the Olympic Games, NBC Sunday Night Football, "The Mission" theme used by NBC News, the television series Lost in Space and Land of the Giants, and the incidental music for the first season of Gilligan's Island. Williams has composed numerous classical concerti and other works for orchestral ensembles and solo instruments; he served as the Boston Pops' principal conductor from 1980 to 1993, and is now the orchestra's laureate conductor. Williams has won five Academy Awards, four Golden Globe Awards, seven British Academy Film Awards, and 22 Grammy Awards. With 50 Academy Award nominations, Williams is the second most-nominated individual, after Walt Disney. In 2005, the American Film Institute selected Williams' score to 1977's Star Wars as the greatest American film score of all time. The soundtrack to Star Wars was additionally preserved by the Library of Congress into the National Recording Registry, for being "culturally, historically, or aesthetically significant." Williams was inducted into the Hollywood Bowl's Hall of Fame in 2000, and was a recipient of the Kennedy Center Honors in 2004 and the AFI Life Achievement Award in 2016. Williams composed the score for eight movies in the Top 20 highest-grossing films at the U.S. box office (adjusted for inflation). John Towner Williams was born on February 8, 1932 in Floral Park, New York, the son of Esther (née Towner) and Johnny Williams, a jazz percussionist who played with the Raymond Scott Quintet. Williams has said of his lineage, "My father was a Maine man—we were very close. My mother was from Boston. My father's parents ran a department store in Bangor, Maine, and my mother's father was a cabinetmaker. [...] People with those roots are not inclined to be lazy." In 1948, the Williams family moved to Los Angeles where John attended North Hollywood High School graduating in 1950. He later attended the University of California, Los Angeles, and studied privately with the Italian composer Mario Castelnuovo-Tedesco. Williams had originally briefly attended Los Angeles City College for one semester as the school had a Studio Jazz Band. In 1952, Williams was drafted into the U.S. Air Force, where he conducted and arranged music for The U.S. Air Force Band as part of his assignments. In 1955, following his Air Force service, Williams moved to New York City and entered The Juilliard School where he studied piano with Rosina Lhévinne. During this time Williams worked as a jazz pianist in the city's many jazz clubs. After moving to Los Angeles he began working as a session musician, most notably for composer Henry Mancini. He worked with Mancini on the Peter Gunn soundtrack where his fellow musicians in the rhythm section included guitarist Bob Bain, bassist Rolly Bundock, and drummer Jack Sperling, many of whom were also featured on the Mr. Lucky television series. Known as "Johnny" during the 1950s early 1960s, Williams composed the music for many TV programs and served as music arranger and bandleader for a series of popular music albums with the singer Frankie Laine. Williams has two brothers, Donald and Jerry, both of whom work as percussionists in Los Angeles. After his studies at Juilliard, and the Eastman School of Music, Williams returned to Los Angeles, where he began working as an orchestrator at film studios. Among other composers, Williams worked with Franz Waxman, Bernard Herrmann, and Alfred Newman, and also with his fellow orchestrators Conrad Salinger and Bob Franklyn. Williams (sometimes credited as "Johnny Williams", because of the already established actor of the same name who had appeared in a number of Alfred Hitchcock films, i.e., Because They're Young (1960) and John Goldfarb, Please Come Home (1965)) composed music for various television programs in the 1960s: the pilot episode of Gilligan's Island, Bachelor Father (1959-1960), the Kraft Suspense Theatre, Lost in Space (1965–68), The Time Tunnel (1966–67), and Land of the Giants (the last three created by the prolific TV producer, Irwin Allen). Williams's first film composition was for the 1958 B movie Daddy-O, and his first screen credit came two years later in Because They're Young. He soon gained notice in Hollywood for his versatility in composing jazz, piano, and symphonic music. Williams received his first Academy Award nomination for his film score for 1967's Valley of the Dolls, and was nominated again for his score for 1969's Goodbye, Mr. Chips. Williams broke through to win his first Academy Award for his film score in the 1971 film Fiddler on the Roof. In 1972, he composed the score for the Robert Altman–directed psychological thriller Images (recorded in collaboration with noted percussionist Stomu Yamashta) which earned him another nomination in the category Best Music, Original Dramatic Score at the 1973 Academy Awards. During the early 1970s, Williams' prominence grew thanks to his work for now–film producer Irwin Allen's disaster films, composing the scores for 1972's The Poseidon Adventure and 1974's The Towering Inferno. In addition, he scored Universal's 1974 film Earthquake for director Mark Robson, completing a "trinity" of scores for the decade's highest-grossing "disaster films". He also scored the 1972 film The Cowboys, a western starring John Wayne and directed by Mark Rydell. In 1974, director Steven Spielberg approached Williams to compose the music for his feature directorial debut, The Sugarland Express. They teamed up again a year later for Spielberg's second film, Jaws. Widely considered to be a classic suspense film, its film score's ominous, two-note ostinato has become synonymous with sharks and approaching danger. The score earned Williams his second Academy Award, his first for an original composition. Shortly thereafter, Spielberg and Williams began a long collaboration for their next feature film together, Close Encounters of the Third Kind. During their two-year-long collaboration, they crafted its distinctive five-note figure that functions both in the background music and as the communications signal of the film's extraterrestrials. Williams also used a system of musical hand signals in the film that were based on hand signs created by John Curwen and refined by Zoltán Kodály. During the same period, Spielberg recommended Williams to his friend and fellow director George Lucas, who needed a composer to score his ambitious 1977 space epic film Star Wars. Williams delivered a grand symphonic score in the fashion of Richard Strauss and Golden Age Hollywood composers Max Steiner and Erich Wolfgang Korngold. Its main theme, "Luke's Theme" is among the most widely recognized in film history, and the "Force Theme" and "Princess Leia's Theme" are well-known examples of leitmotif. Both the film and its score were immensely successful—it remains the highest grossing non-popular music recording of all-time—and Williams won another Academy Award for Best Original Score. In 1980, Williams returned to score The Empire Strikes Back, where he introduced "The Imperial March" as the theme for Darth Vader and the Galactic Empire, "Yoda's Theme", and "Han Solo and the Princess". The original Star Wars trilogy concluded with the 1983 film Return of the Jedi, for which Williams' score provided most notably the "Emperor's Theme", "Parade of the Ewoks", and "Luke and Leia". Both scores earned him Academy Award nominations. Williams worked with director Richard Donner to score the 1978 film Superman. The score's heroic and romantic themes, particularly the main march, the Superman fanfare and the love theme, known as "Can You Read My Mind," appeared in the four sequel films. For the 1981 film Raiders of the Lost Ark, created by Lucas and directed by Spielberg, Williams wrote a rousing main theme known as "The Raiders March" to accompany the film's hero, Indiana Jones. He composed separate themes to represent the Ark of the Covenant, the character Marion, and the story's Nazi villains. Additional themes were featured in his scores to the sequel films Indiana Jones and the Temple of Doom (1984), Indiana Jones and the Last Crusade (1989), and Indiana Jones and the Kingdom of the Crystal Skull (2008). Williams composed an emotional and sensitive score to Spielberg's 1982 fantasy film E.T. the Extra-Terrestrial. Williams was awarded a fourth Academy Award for this score. The Spielberg-Williams collaboration resumed with the director's 1987 film Empire of the Sun, and has continued to the present, spanning genres from science fiction thrillers (1993's Jurassic Park), to somber tragedies (1993's Schindler's List, 2005's Munich), to Eastern-tinged melodramas (2005's Memoirs of a Geisha, directed by Rob Marshall), to dramatic war films (1998's Saving Private Ryan). Spielberg has said, "I call it an honorable privilege to regard John Williams as a friend." In 1999, George Lucas launched the first of a series of prequels to the original Star Wars trilogy. Williams was asked to score all three films, starting with The Phantom Menace. Along with themes from the previous films, Williams created new themes to be used as leitmotifs in 2002's Attack of the Clones and 2005's Revenge of the Sith. Most notable of these was "Duel of the Fates", an aggressive choral movement in the style of Verdi's Requiem, utilizing harsh Sanskrit lyrics that broadened the style of music used in the Star Wars films. Also of note was "Anakin's Theme", which begins as an innocent childlike melody and morphs insidiously into a quote of the sinister "Imperial March." For Episode II, Williams composed "Across the Stars", a love theme for Padmé Amidala and Anakin Skywalker (mirroring the love theme composed for The Empire Strikes Back). The final installment combined many of the themes created for the series' previous films, including "The Emperor's Theme," "The Imperial March", "Across the Stars", "Duel of the Fates", "The Force Theme", "Rebel Fanfare", "Luke's Theme", and "Princess Leia's Theme", as well as new themes for General Grievous and the film's climax, entitled "Battle of the Heroes". In the new millennium, Williams was asked to score the film adaptations of J. K. Rowling's widely successful book series, Harry Potter. He went on to score the film franchise's first three installments. As with his Superman theme, the most important theme from Williams' scores for the Harry Potter films, dubbed "Hedwig's Theme", has been used in the fourth through to the eighth films (Harry Potter and the Goblet of Fire, Harry Potter and the Order of the Phoenix, Harry Potter and the Half-Blood Prince, Harry Potter and the Deathly Hallows – Part 1 and Harry Potter and the Deathly Hallows – Part 2), scored by Patrick Doyle (Goblet of Fire), Nicholas Hooper (Order of the Phoenix and Half-Blood Prince) and Alexandre Desplat (Deathly Hallows). Like the main themes from Jaws, Star Wars, Superman, and Indiana Jones, fans have come to identify the Harry Potter films with Williams' original compositions. Williams was asked to return to score the film franchise's final installment, Harry Potter and the Deathly Hallows – Part 2, but director David Yates stated that "their schedules simply did not align" as he would have had to provide Williams with a rough cut of the film sooner than was possible. In 2006, Superman Returns was completed under Bryan Singer's direction, best known for directing the first two films in the X-Men series. Although Singer did not request Williams to compose a score for the intentionally Donner-esque film, he employed the skills of X2 composer John Ottman to incorporate Williams' original Superman theme, as well as those for Lois Lane, Krypton and Smallville. In 2011, the "Main Title Theme" and elements of "Can You Read My Mind" were notably used in the final scene of "Finale," the series finale of the WB/CW television series Smallville. 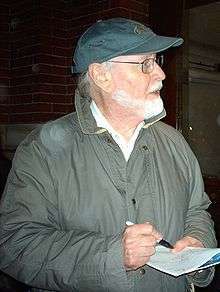 Don Davis performed a similar role for Jurassic Park III, recommended by Williams himself to the producers. In 2008, Williams returned to the Indiana Jones series to score the fourth film—Indiana Jones and the Kingdom of the Crystal Skull. He received a Grammy nomination for his work on the film. Indiana Jones and the Kingdom of the Crystal Skull was also the only film score from the Indiana Jones film series not to be nominated for an Academy Award. During 2008, he also composed music for two documentaries, Warner at War, and A Timeless Call, the latter of which was directed by Steven Spielberg. After a three-year absence from film scoring, Williams composed the scores for Spielberg's The Adventures of Tintin and War Horse in 2011. Both scores received overwhelmingly positive reviews, with both scores earning Oscar nominations, and the latter being nominated for a Golden Globe. The Oscar nominations are Williams' 46th and 47th, making him the most nominated musician in Academy Awards history (having previously been tied with Alfred Newman's 45 nominations), and the second most nominated overall, following Walt Disney. Williams won an Annie Award for his score for The Adventures of Tintin in 2012. In 2012, Williams scored Spielberg's film Lincoln and subsequently received his 48th Academy Award nomination. In February 2013, Williams conducted the Young Musician's Foundation Debut Orchestra and also expressed his interest in working in the Star Wars sequel trilogy, stating: "Now we’re hearing of a new set of movies coming in 2015, 2016... so I need to make sure I'm still ready to go in a few years for what I hope would be continued work with George." He also scored the 2013 film The Book Thief, which marked his first collaboration with a director other than Spielberg since 2005. The score earned him Academy Award, Golden Globe and BAFTA nominations and earned him a Grammy Award for Best Instrumental Composition. It was his 44th nomination for Best Original Score (and 49th overall), setting a new record for the most nominations in that category (he previously tied Alfred Newman's record of 43 nominations in 2013). In 2015, he scored Star Wars: The Force Awakens, earning him his 50th Academy Award nomination. Williams was also set to write the score for Bridge of Spies that year, which would have been his 27th collaboration with director Steven Spielberg. However, in March 2015, it was announced that Thomas Newman would replace Williams for the film, as Williams' schedule was interrupted by a minor health issue and he became unavailable to score the film. This is the first Spielberg film since The Color Purple (1985) not scored by Williams. In 2016, Williams composed the score for Spielberg's The BFG, which opened in July 2016. Williams will score the animated short film "Dear Basketball" directed by Glen Keane and based on a poem by Kobe Bryant. Williams has expressed interest in composing the score for Star Wars: Episode VIII, to be released on December 15, 2017. On June 9, 2016, an interview with Variety stated he "expects" to start working on it in 2017 if attached to the project. At a Tanglewood concert in August 2016, Williams confirmed he is scheduled to start scoring the film. He has also been attached to compose the scores for Steven Spielberg's Ready Player One adaptation and the fifth Indiana Jones film. From 1980–93, Williams succeeded Arthur Fiedler as the Boston Pops Orchestra's Principal Conductor. Williams never met Fiedler in person but spoke with him by telephone. His arrival as the Pops' new leader in the spring of 1980 allowed him to devote part of the Pops' first PBS broadcast of the season to presenting his new compositions for The Empire Strikes Back. Williams almost ended his tenure with the Pops in 1984. Considered a customary practice of opinion, some players hissed while sight-reading a new Williams composition in rehearsal; Williams abruptly left the session and turned in his resignation. He initially cited mounting conflicts with his film composing schedule, but later admitted a perceived lack of discipline in, and respect from, the Pops' ranks, culminating in this latest instance. After entreaties by the management and personal apologies from the musicians, Williams withdrew his resignation and continued as principal conductor for nine more years. In 1995, he was succeeded by Keith Lockhart, the former associate conductor of the Cincinnati Symphony Orchestra and Cincinnati Pops Orchestra. Williams has written many concert pieces, including a symphony; a Concerto for Horn written for Dale Clevenger, the Chicago Symphony Orchestra's Principal Hornist; a Concerto for Clarinet written for Michele Zukovsky (the Los Angeles Philharmonic's Principal Clarinetist) in 1991; a sinfonietta for wind ensemble; a cello concerto premiered by Yo-Yo Ma and the Boston Symphony Orchestra at Tanglewood in 1994; concertos for the flute and violin recorded by the London Symphony Orchestra; and a trumpet concerto, which was premiered by The Cleveland Orchestra and their principal trumpet Michael Sachs in September 1996. His bassoon concerto, "The Five Sacred Trees", which was premiered by the New York Philharmonic and principal bassoon player Judith LeClair in 1995, was recorded for Sony Classical by Williams with LeClair and the London Symphony Orchestra. Williams was the subject of an hour-long documentary for the BBC in 1980, and was featured in a report on 20/20 in 1983. In 1985, Williams was commissioned by NBC to compose a television news music package for various network news spots. The package, which Williams named "The Mission," consists of four movements, two of which are still used heavily by NBC today for Today, NBC Nightly News, and Meet the Press. He composed the "Liberty Fanfare" for the Statue of Liberty's rededication, "We're Lookin' Good!" for the Special Olympics in celebration of the 1987 International Summer Games, and themes for the 1984, 1988, 1996, and 2002 Olympic Games. His most recent concert work, "Seven for Luck", for soprano and orchestra, is a seven-piece song cycle based on the texts of former U.S. Poet Laureate Rita Dove. "Seven for Luck" was given its world premiere by the Boston Symphony under Williams with soprano Cynthia Haymon. Williams makes annual appearances with the Los Angeles Philharmonic at the Hollywood Bowl, and took part as conductor and composer in the orchestra's opening gala concerts for the Walt Disney Concert Hall in 2003. In 2004, Williams both served as the Grand Marshal for the Rose Parade, and directed "The Star Spangled Banner" at the Rose Bowl's beginning. In April 2005, Williams and the Boston Pops performed the "Throne Room Finale" from Star Wars at opening day in Fenway Park as the Boston Red Sox, having won their first World Series championship since 1918, received their championship rings. For Game 1 of the 2007 World Series, Williams conducted a brass-and-drum ensemble through a new dissonant arrangement of the "Star Spangled Banner." In February 2004, April 2006, and September 2007, he conducted the New York Philharmonic at Avery Fisher Hall in New York City. 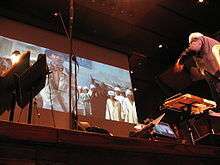 The initial program was intended to be a one-time special event, and featured Williams' medley of Oscar-winning film scores first performed at the previous year's Academy Awards. Its unprecedented popularity led to two concerts in 2006: fundraising gala events featuring personal recollections by film directors Martin Scorsese and Steven Spielberg. Continuing demand fueled three more concerts in 2007, which all sold out. These featured a tribute to the musicals of film director Stanley Donen, and had the distinction of serving as the New York Philharmonic season's opening event. After a three-season absence, Williams conducted the Philharmonic once again in October 2011. Maestro Williams also conducted the National Symphony Orchestra, the U.S. Army Herald Trumpets, the Joint Armed Forces Chorus, and the Choral Arts Society of Washington performing his new arrangement of "The Star-Spangled Banner" for its 200th anniversary. The performance was held at A Capitol Fourth, an Independence Day celebration concert in Washington, D.C., on July 4, 2014. Williams married Barbara Ruick, an American actress and singer, in 1956. Together they had three children: Jennifer (b. 1956), Mark Towner Williams (b. 1958), and Joseph (b. 1960), who is the lead singer of Toto. The two remained married until her death in 1974. In 1980, Williams married Samantha Winslow, a photographer. John Williams has been nominated for 50 Academy Awards, winning 5; 6 Emmy Awards, winning 3; 25 Golden Globe Awards, winning 4; 65 Grammy Awards, winning 22; and has received 7 British Academy Film Awards. With 50 Oscar nominations, Williams currently holds the record for the most Oscar nominations for a living person, and is the second most nominated person in Academy Awards history behind Walt Disney's 59. Forty-five of Williams' Oscar nominations are for Best Original Score and five are for Best Original Song. He won four Oscars for Best Original Score and one for Best Scoring: Adaptation and Original Song Score (Fiddler on the Roof). Williams has been inducted into the American Classical Music Hall of Fame and the Hollywood Bowl Hall of Fame. Williams was honored with the annual Richard Kirk award at the 1999 BMI Film and TV Awards, recognizing his contribution to film and television music. In 2004, he received Kennedy Center Honors. He won a Classic Brit Award in 2005 for his soundtrack work of the previous year. Notably, Williams has won the Grammy Award for Best Instrumental Composition for his scores for Star Wars, Close Encounters of the Third Kind, Superman, The Empire Strikes Back, E.T. the Extra-Terrestrial, Angela's Ashes, Munich, Indiana Jones and the Kingdom of the Crystal Skull, and The Book Thief. The competition includes not only composers of film scores, but also composers of instrumental music of any genre, including composers of classical fare such as symphonies and chamber music. In 1993, Williams received an Honorary Doctor of Music degree from Boston College. Williams was made an honorary brother of Kappa Kappa Psi at Boston University in the late 1980s. In 2013, Williams was presented with the Ken Burns Lifetime Achievement Award. In 2005, the American Film Institute selected Williams' richly thematic and highly popular score to 1977's Star Wars as the greatest American film score of all time. His scores for Jaws and E.T. also appeared on the list, at No. 6 and No. 14, respectively. He is the only composer to have three scores on the list. Williams received the AFI Life Achievement Award in June 2016, becoming the first composer to receive the award. ↑ Burlingame, Jon (June 9, 2016). "AFI Honoree John Williams Looks Back on Six Decades of Iconic Themes". Variety. Retrieved July 11, 2016. 1 2 "John Williams won't score a Steven Spielberg film for the first time in 30 years". The Verge. March 18, 2015. Retrieved June 8, 2015. ↑ "John Williams: The Last Movie Maestro". The Wall Street Journal. December 17, 2011. Retrieved July 11, 2016. ↑ "Boston Pops - John Williams", bso.org; retrieved November 29, 2015. ↑ Gray, Tim (October 8, 2015). "John Williams Tapped for 44th AFI Life Achievement Award". Variety. Retrieved July 11, 2016. ↑ "Nominee Facts - Most Nominations and Awards", Academy of Motion Picture Arts and Sciences; retrieved November 29, 2015. ↑ Profile, boxofficemojo.com; accessed December 28, 2015. ↑ "John Williams, el compositor de la aventura". Revista Esfinge. Retrieved 2012-04-30. ↑ Thomas, David (October 25, 1997). "The King of Popcorn". The Sydney Morning Herald: 10s. 1 2 Sony Classical Williams Biography at the Wayback Machine (archived October 12, 2007) at www.sonybmgmasterworks.com; retrieved September 29, 2007. ↑ Los Angeles City College website, lacitycollege.edu; accessed December 28, 2015. ↑ Barrett, Heather (2015-09-30). "Star Wars composer John Williams' first score a 1952 Newfoundland film". CBC News. Retrieved 2015-12-31. ↑ Barton, Tom. A Musical Biography of John Williams. Retrieved 2015-12-31. ↑ Casey, Dan (2015-11-01). 100 Things Star Wars Fans Should Know & Do Before They Die. Triumph Books. ISBN 1633193454. Retrieved 2015-12-31. ↑ Don Williams profile, imdb.com; accessed October 9, 2015. ↑ "Romanticism". Retrieved August 25, 2006. ↑ "Star Wars and Wagner's Ring". Retrieved August 15, 2010. ↑ John Williams Biography at FilmReference.com. ↑ "Deanna Lund Meets John Williams At Lincoln Party". Irwin Allen News Network. Retrieved 2015-12-31. 1 2 3 4 5 "Academy Awards and Nominations". John Williams Web Pages. Retrieved 2015-12-31. ↑ "The Cowboys (1972) - Full Cast and Crew", imdb.com; retrieved November 30, 2015. ↑ "Encounters Not Close Enough". Vikileaks. 2011-01-11. Retrieved 2015-12-31. 1 2 Larsen, Peter, and Irons, John (2007). Film Music, p.168. ISBN 9781861893413. ↑ "'Star Wars Episode 7': John Williams Will Probably Score the Sequel, According to J. J. Abrams". Moviefone. 2013-05-01. Retrieved 2015-12-31. ↑ Larsen & Irons (2007), p.171. ↑ Spielberg, Steven (1993). "Back cover". Jurassic Park Audio CD (Original Motion Picture Soundtrack CD) (Media notes). MCA. "...and I consider it a privilege to call John my Friend." ↑ http://h2g2.com/approved_entry/A563942 "Reminiscent of the 'Dies Irae' from Verdi's Requiem, 'Duel of the Fates' was written to accompany the climactic lightsabre battle in the first of the Star Wars prequels. While much of the film failed to meet the expectations generated by its hype, this scene stood out as a dazzling work of fight choreography, and the score was an important part of that." ↑ Richards, Mark (2015-11-30). "Celebrating Star Wars Themes Part 4". Film Music Notes. Retrieved 2015-12-31. ↑ Richards, Mark (2015-11-30). "Celebrating Star Wars Themes Part 5". Film Music Notes. Retrieved 2015-12-31. ↑ Richards, Mark (2015-11-30). "Celebrating Star Wars Themes Part 6". Film Music Notes. Retrieved 2015-12-31. ↑ "Program Notes". Wheaton Symphony. Retrieved 2015-12-31. ↑ Al Septien, Turi Meyer, Brian Peterson & Kelly Souders (writers); Greg Beeman & Kevin Fair (directors) (May 13, 2011). "Finale". Smallville. Season 10. Episode 21. The CW. ↑ "Composer Don Davis, Welcome to Jurassic Park". Tracksounds. 2001-06-29. Retrieved 2015-12-31. ↑ Warner at War (2008) (TV) - Full cast and crew, imdb.com; accessed November 3, 2015. ↑ A Timeless Call (2008) - cast and crew, imdb.com; accessed December 28, 2015. ↑ "The Adventures of Tintin: The Secret of the Unicorn (John Williams)". Filmtracks. Retrieved 2012-04-30. ↑ "War Horse (John Williams)". Filmtracks. 2011-11-21. Retrieved 2012-04-30. ↑ "The Adventures of Tintin: The Secret of the Unicorn (John Williams)". Moviecues.com. 2011-11-01. Retrieved 2012-04-30. ↑ "War Horse (John Williams)". Moviecues.com. 2011-12-04. Retrieved 2012-04-30. ↑ "The Adventures Of Tintin: The Secret Of The Unicorn – John Williams". Moviemusicuk.us. 2011-10-23. Retrieved 2012-04-30. ↑ "The Adventures of Tintin: The Secret of the Unicorn soundtrack review". movie-wave.net. Retrieved 2012-04-30. ↑ "Winners for the 84th Academy Awards". Oscars.org. Retrieved 2012-04-30. ↑ "2013 Academy Award Nominees Announced". mediaite.com. 2013. Retrieved 2013-01-10. ↑ "Williams Says He 'Hopes' to Work on New Star Wars Trilogy". jwfan.com. 2013-02-11. Retrieved 2013-02-12. ↑ "John Williams to Score 'The Book Thief'". Film Music Reporter. August 6, 2013. Retrieved August 6, 2013. ↑ "Williams confirms he will score Episode VII". jwfan.com. 2013-05-23. Retrieved 2013-05-23. ↑ "Oscar Nominations 2016: Star Wars: The Force Awakens". oscars.go.com. 2016-01-14. Retrieved 2015-01-14. ↑ Fischer, Russ (March 3, 2015). "New Steven Spielberg and Tom Hanks Film Titled 'Bridge of Spies,' John Williams Confirmed to Score". slashfilm.com. Retrieved March 4, 2015. ↑ "Thomas Newman Replaces Williams on "Bridge of Spies"". jwfan.com. March 18, 2015. Retrieved March 18, 2015. ↑ Spangler, Todd (2016-05-05). "Kobe Bryant Inks Sports Illustrated Deal for 'Dear Basketball' Animated Film". Variety. Retrieved 2016-06-10. ↑ McCormick, Rich (August 16, 2016). "John Williams confirms he's working on the score for Star Wars: Episode VIII". The Verge. Retrieved August 16, 2016. ↑ Burlingame, Jon (2016-06-09). "AFI Honoree John Williams Looks Back on Six Decades of Iconic Themes". Variety. Retrieved 2016-06-10. ↑ "John Williams Will Compose Indiana Jones 5 and Star Wars Episode VIII Score". Slashfilm. 2016-06-10. Retrieved 2016-06-10. ↑ Holland, Bernard (June 14, 1984). "Boston Pops Conductor Resigns Abruptly". New York Times. Retrieved September 17, 2007. ↑ Clendinen, Dudley (May 1, 1985). "At 100, the Boston Still Packs Them In". New York Times. Retrieved September 17, 2007. ↑ Edwards, David Noel (2015-08-25). "Tanglewood Film Night Without John Williams?". The Berkshire Edge. Retrieved 2015-12-31. ↑ "Concerto for Clarinet". MyTempo.com. 1991. Retrieved September 17, 2007. 1 2 "Concert Works". John Williams Fan Network. 2015. Retrieved 2015-12-31. 1 2 "John Williams: Videos" from the John Williams Fan Network, June 2, 2007. ↑ Ecks, Johnny (February 12, 2004). "John Williams: the Art of the Score (review)". JWFan.com. Retrieved 2013-05-22. ↑ Kozinn, Allan (April 26, 2006). "Philharmonic and Film: Sound to Bring Pictures to Life". New York Times. Retrieved 2013-05-22. ↑ Chris Matthew Sciabarra, "John Williams & the NY Philharmonic" from Notablog, 16 May 16, 2006. ↑ Kozinn, Allan (September 9, 2007). "Classical: Just in Time for Timeless Melodies". New York Times. Retrieved 2013-05-22. ↑ Anthony Tommasini, "John Williams: NY Philharmonic (review)" from New York Times, September 17, 2007. ↑ Groner, Danny (October 26, 2011). "John Williams Makes Movie Music Come Alive". Huffington Post. Retrieved 2013-05-22. ↑ "Legendary Composer John Williams to Pay Tribute to National Anthem on PBS' A CAPITOL FOURTH". Broadway World. 2014-06-25. Retrieved 2015-12-31. ↑ "John Williams Net Worth". TheRichest. ↑ "Williams, John biography". Retrieved May 6, 2007. ↑ "John Williams Film Music Box Biography Discography News". Archived from the original on September 27, 2007. Retrieved May 6, 2006. ↑ "BMI Film/Awards:1999". bmi.com. Retrieved November 4, 2010. ↑ "Boston College Fact Book, 1998-1999" (PDF). Retrieved August 28, 2015. ↑ "IOC awards the Olympic Order to John Williams". IOC. May 1, 2003. Retrieved December 19, 2011. ↑ "Remarks by the President at Presentation of the National Humanities Medal and the National Medal of the Arts | The White House". February 25, 2010. Retrieved July 4, 2011. ↑ "Kappa Kappa Psi Theta Beta at Boston University". ↑ "Ken Burns Lifetime Achievement Award". ↑ "AFI 100 Years of Film Scores". Web.archive.org. 2007-10-22. Archived from the original on 2007-10-22. Retrieved 2011-09-05. ↑ Gray, Tim (October 8, 2015). "John Williams Tapped for 44th AFI Life Achievement Award". Variety. Retrieved February 28, 2016. ↑ "Great Performances wins Primetime Emmy; John Williams interview". WNET. September 15, 2009. Retrieved January 21, 2013. Audissino, Emilio: "Golden Age 2.0: John Williams and the Revival of the Symphonic Film Score". In: Stoppe, Sebastian (2014). Film in Concert. Film Scores and their Relation to Classical Concert Music. Glücksstadt, Germany: VWH Verlag. pp. 109–124. ISBN 978-3-86488060-5. Paulus, Irena: "Williams versus Wagner—Or an Attempt at Linking Musical Epics". In: Stoppe, Sebastian (2014). Film in Concert. Film Scores and their Relation to Classical Concert Music. Glücksstadt, Germany: VWH Verlag. pp. 63–108. ISBN 978-3-86488060-5. Moormann, Peter (2010). Spielberg-Variationen: die Filmmusik von John Williams (in German). Baden-Baden: Nomos, Edition Reinhard Fischer. p. 797. ISBN 978-3-8329-5355-3. Aschieri, Roberto (1999). Over the Moon: La Mứsica de John Williams Para El Cine (in Spanish). Santigo, Chile: Función Privada, sponsored by Universidad Diego Portales. p. 400. ISBN 978-4-89799-246-4. 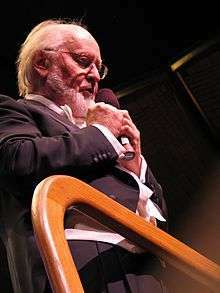 Wikimedia Commons has media related to John Williams.